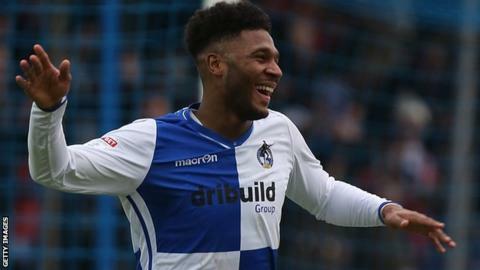 Bristol Rovers forward Ellis Harrison has signed a new, undisclosed-length contract with the League One club. The 23-year-old has scored 32 league goals for the club with whom he started his career, making his debut in 2011. Other than a brief loan spell with Hartlepool in 2016, Harrison has spent his entire senior career at Rovers, helping them to consecutive promotions from the National League to League Two. He netted four times in a game, during a 5-0 win over Northampton, in January. Harrison told the club website: "The fans are the biggest reason behind me signing a new contract. "Last season was very disappointing for me and I didn't get anywhere near the targets I set myself, but this year I'm determined to achieve the goals I set myself." Meanwhile, Rovers have had a double bid for Peterborough's Luke James and Tom Nichols rejected, according to Posh chairman Darragh MacAnthony. Rovers declined to comment on the alleged offer, following a post on social media from MacAnthony.